Happy Friday everyone! Welcome to another edition of Crime Watch's popular author interview series, 9mm. Today, for the 132nd instalment in the series, I'm pleased to welcome British author Matthew Frank. 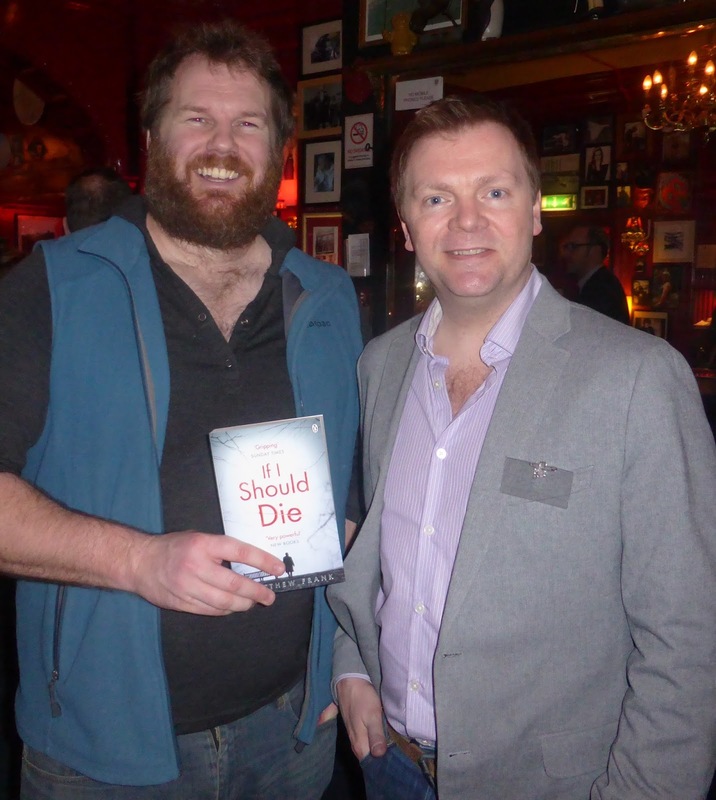 I had the pleasure of meeting Frank at the Penguin Crime Drinks in Soho earlier this year (see photo below, with me in full travelling bear mode), before I hopped on a plane back to New Zealand. 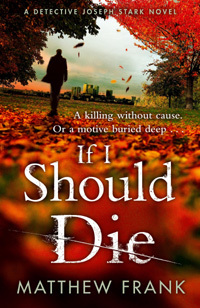 His debut novel, IF I SHOULD DIE, came out last year in hardback, and got a lot of rave reviews. It introduced London detective Joseph Stark, a veteran of the Afghan war, and revolves around an investigation into someone attacking homeless people in South London. Some reviewers have called it the best start to a new crime series they've read in the past decade. IF I SHOULD DIE is now also available in paperback and I understand we'll see Frank's sophomore novel hit shelves this year. But for now, Matthew Frank becomes the latest teller of crime tales to stare down the barrel of 9mm. I always feel slightly shy admitting that crime fiction forms only a small part of my eclectic reading. I get most of my crime fix from TV, everything from Morse/Endeavour and Sherlock to guilty-pleasure American pulp like Blue Bloods and Elementary. I really enjoyed Zen, and was disappointed when the BBC cancelled it. I’ll definitely read the books in the future when someone invents a machine for squeezing extra hours in the day. But, put on the spot, my favourite literary detective might have to be Samuel Vimes, from the late great Sir Terry Pratchett. I hear purists wincing, but if you want a copper dragging himself from the gutter (literally) and doing the right thing because all he has left is his principles, a rookie-with-a-destiny and a police lycanthrope, then look no further. But the first book I remember reading that really gripped me was The Hobbit, followed in the shortest possible order by Lord of the Rings. The latter remains one of my favourite books, for its portrayal of friendship, endurance and sacrifice; and shear imagination. The last thing I read that engrossed me completely was the Mars Trilogy by Kim Stanley Robinson. I started writing late, probably when I realised that day-dreaminess could have a productive outlet. How I got going is another story (see my website www.matthewfrank.co.uk/blog/), but the first thing I finished was a novel, working title: 'Fear To Tread' – a present-day comic fantasy thriller with a surreal theological twist (and, I later realised, a strong police thread that I thoroughly enjoyed). Hard to pitch, though. They say ‘write what you know,’ but I wrote what I wanted to read – at that time, often Pratchett and Neil Gaiman. The opening chapters quickly amassed a crushing two rejections before I moved on to Stark, but I’d love to dust it off; it was a blast to write and read back. I work full time as an Architect but my chief and best occupation is my wife and three young sons. Before writing took off, my primary hobby was wreck diving. UK coast waters may be cold and dark, but they are littered with history. For now the rebreather gathers dust, waiting for that time-machine I mentioned earlier. In the meantime I get out on my mountain bike when the trails are just too perfect to ignore and write in whatever marginal time presents itself. Herne Bay is a town on the north coast of Kent. It’s best asset is the sea. I grew up swimming, skimming stones, sailing dinghies and playing video games in the arcades. It’s upstart neighbour, Whitstable, seems to have grown in fame since the oysters became popular with Londonites, and nearby Canterbury has all the best History. Herne Bay used to have the second longest pier in the country until most of the neck was destroyed by a storm in 1978. I remember walking out past the wreckage at low tide. Hot summer-day top-tip for kids of all ages - after paddling and throwing stones into the brown sea, bouncing on the trampolines and ice cream in the bandstand… Dropping coins into the Telly-Go-Round (google it – words don’t do justice). I could only hope for Mark Rylance, because he’s probably the only actor in the world capable of turning doing-nothing-much-out-of-the-ordinary into something utterly compelling. IF I SHOULD DIE - without a doubt. Partly because it’s the first book I got published, but mostly because it’s the only book I’ve got published so far. I hope the sequel becomes my new favourite when it’s finished, and so on… My current second favourite for now is the one in the drawer (see question #3); maybe someday people will read it (#PublishFearToTread - smiley face emoji etc.). I don’t know how common this is, but there wasn’t one big moment. I got an agent by luck, went through edits and then IISD went off to the usual publisher suspects, who all said no. Luckily their reason was consistent and addressable. The publisher that had come closest (Penguin - Michael Joseph) offered a sit down, so I stayed up half the night drafting a tweaked synopsis, which was met with enthusiasm. Not long after we got ‘the call’. I was overjoyed, but still had to deliver the rewrite. After that it was a series of thrills – getting a great reaction to the rewrite, receiving bound proofs in the post, getting a finished hardback handed to me at a Penguin PR do, and finally first seeing my debut in a bookshop. I’ve yet to spot a stranger on a train reading it, but I live in hope. My debut Publication Day actually coincided with my 10th Wedding Anniversary, and we celebrated both in style – It doesn’t get better than that. My first literary festival panel (Crimefest 2014) was in itself one of the strangest experiences. A room full of people expecting words of wisdom, when my book wasn’t even quite out. Luckily there were four other much more experienced authors on the panel to help me through. Of course when you book isn’t quite out yet, it makes the after-panel book signing a bit awkward. Luckily my publisher moved heaven and earth to get a box-load delivered next day, and a lovely lady named Emily rushed up to me with two copies to sign. So I met the very first person to buy my book. – It doesn’t get much stranger, or memorable, than that. You can read more about Matthew Frank at his website here.